From beginning to end OCS wants to make your transportation to Disney World seamless. We offer only the highest quality service at the most reasonable rates in Orlando. We have customer service representatives standing by 24 hours a day to assist you in answering any questions you may have. We monitor all our guests flight information to assure you that your chauffeur is waiting for you when you arrive in Orlando Airport and head over to Disney World to start your vacation. We will have our chauffeur standing by the baggage claim for your airlines holding a sign with your name on it bearing a smile and welcoming you to our beautiful Sunshine State. We set the bar extremely high and many of our competitors are just not able to compete when it comes to the level of service. We assure you seamless transportation from beginning to end. When calling around you may talk to other company representatives that have very strong accents and very poor customer service skills. We have customer service representatives eager to answer any questions you have and to make sure all your personal needs are met. We personalize our services to meet all your needs. We also allow a complimentary 15 minute stop along the way to your resort to allow you to get any last minute items you'd like to have while you stay at Disney World. 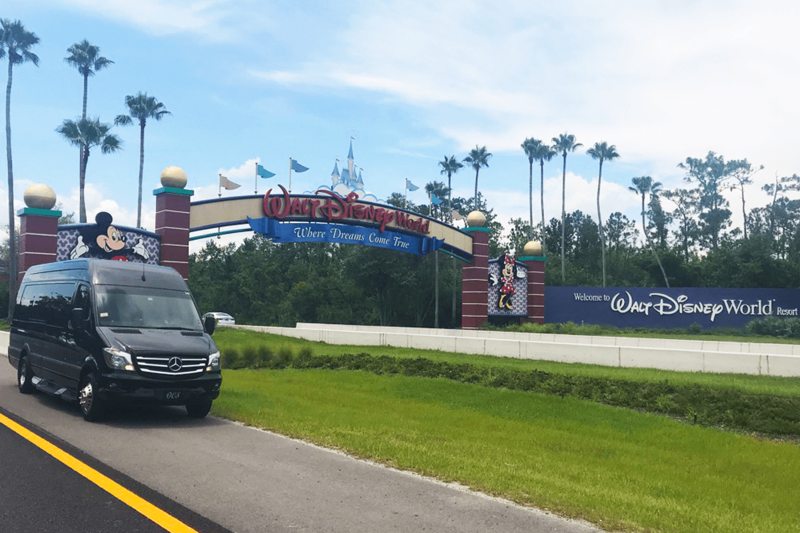 The journey from Orlando Airport to Disney World is approximately 30 minutes and we transport you in style every time. Still not convinced this is the way to travel to your Disney World destination? Call one of our customer service representatives and see how we can assist you in making your family vacation excellent!